Note : adjustments for a game with 2 or 3 players are to be found at the end of the booklet. Place the board in the middle of the table. For your first game, we suggest you use the beginner side. Place all the resources near the board to create a general reserve. Choose a first player at random, who shuffles and deals out 2 private contracts to each player. The first player then shuffles the neutral contracts and places them face down on the board. Reveal the first 4 cards of that draw pile and place them face up on their spaces. The end-of-game card is placed on its dedicated space. Randomly remove one of the special exploitation tokens and put it back in the game box, it won't be used for the whole game. Shuffle all the remaining exploitation tokens (spe- cial and regular) face down and place one on each meadow space of the main board before flipping them over to reveal their front. Swap each of the 4 special exploitations with a batch of 5 resources of the kind in- dicated on the token. These 4 spaces are now neutral exploitations (they belong to no player in particular). Take a guild board each and all the elements of your chosen color. 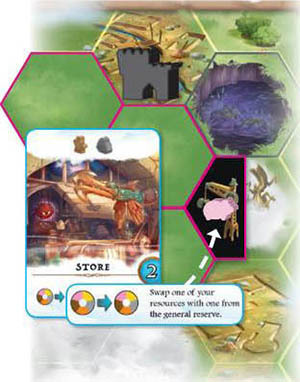 Place your 5 buildings, 3 building sites and 2 craftsmen on their dedicated spaces (the 3 rd craftsman returns to the game box). Finally, place on your board 4 stacks of 3 meadow tiles. 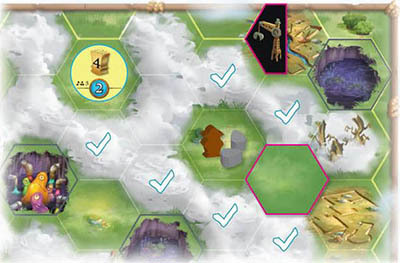 By the side of the board, form a reserve with the remaining meadow tiles. Collect points (representing glory, prestige, and riches), you will mainly fulfill contracts and open exploitations. 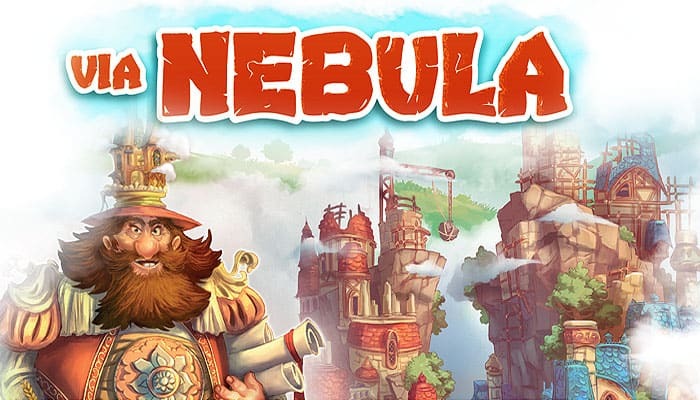 the player with the most points at the end of the game is declared the winner and hero of nebula! The first player starts, then the game proceeds clockwise. Note : You may carry out the same action more than once during your turn, but remember action Dcosts TWO of your actions. Place one of your available craftsmen onto any space containing an exploitation token. Take that token and put it face down next to your guild board, and then place on the space as many resources of the type indicated by the token. You just opened a new exploitation. Note : an available craftsman is one on your guild board. You can not choose this action if you do not have an available craftsman. Example: Blue places a craftsman on the space containing the "3 Wood" token. She takes the token and places it face down next to her guild board. She then places 3 Wood resources where she just placed her craftsman. Take one of your own building sites, and cover a free half of a ruins space not already covered by another building site or building. All ruins spaces have room for two building sites. They may simultaneously contain two sites belonging to the same player or two different players. You can not choose this action if you don't have an available building site. You can not choose never have more building sites present on the main board than you have buildings left on your guild board. Example : Black decides to place a building site. A is not an option as both halves of the space are occupied, but B, C, and Dare all possible. 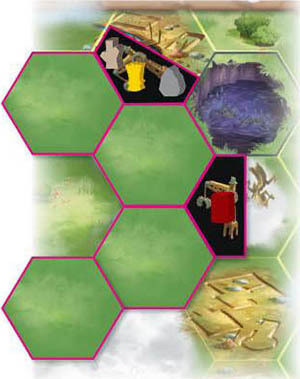 Take a meadow tile from the leftmost pile on your guild board and place it on a fog space. That space must be either: adjacent to a space occupied by an element of your color (craftsman, building site or building), or adjacent to an empty meadow space or tile (that is, without any resources or exploitation token on it). Example : Black decides to explore a fog space. 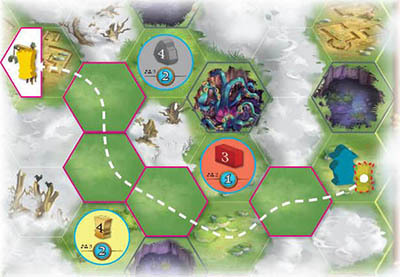 He takes a meadow tile from his board and must place it on a fog space. In the example below, he may cover any space marked with a tick, as they are all either adjacent to a space he occupies or adjacent to an empty meadow space. Take a meadow tile from the leftmost pile on your guild board and place it on a petrified forest. That forest must be either: adjacent to a space occupied by an element of your color (craftsman, building site or building), or adjacent to an empty meadow space or tile (that is, without any resources or exploitation token on it). Important : This action uses two of your actions. Therefore, after you explore a petrified forest, your turn is immediately over. Example : Blue decides to explore a petrified forest. He takes a meadow tile from his board. In the example below, he may cover any space marked with a tick, as they are all either adjacent to a space he occupies or adjacent to an empty meadow space. Once his choice is made, his turn is over since exploring a petrified forest costs two actions. 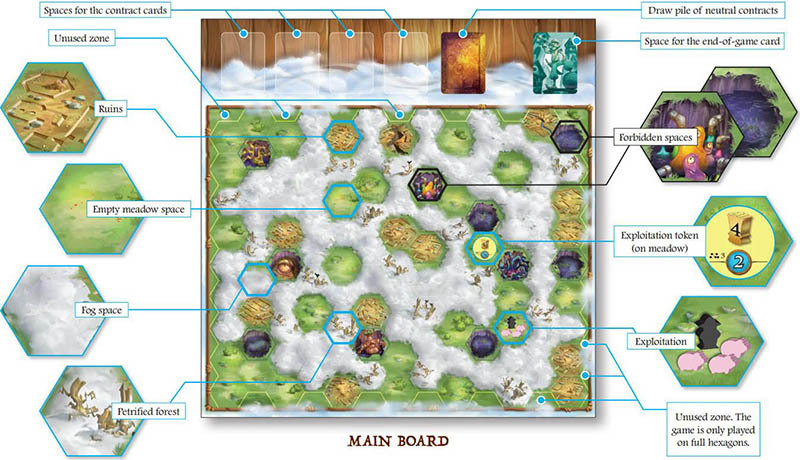 When you explore, you use the meadow tiles placed on your guild board. When depleted, each pile reveals an explorer. At the end of the game each explorer rewards you with 2 points. Note: if you want to explore but happen to have run out of tiles, you may use the tiles from the reserve, as long as there are some left. Choose and take a resource from any exploitation that is occupied by one of your craftsmen, by the craftsman of an opponent, or by no one i.e. a neutral exploitation. Transport the chosen resource to one of your own building sites following an uninterrupted path of empty meadow spaces. 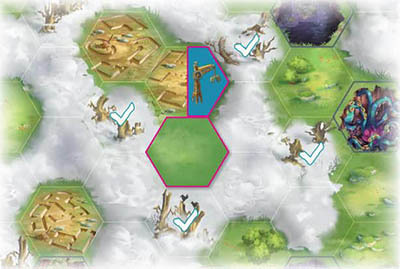 These spaces may be tiles placed by the players during the game or depleted exploitations. If the resource you picked was the last of the exploitation, the owner of the craftsman retrieves it and puts it back on his guild board. That way, the exploitation is fully depleted and the space now counts as an empty meadow space. It is henceforth possible to move normally through this space. Example : White decides to transport a resource. He takes a Wheat from the Blue exploitation and delivers it to his own building site following an uninterrupted path of empty spaces. Since he has taken the last Wheat of the eploitation, Blue retrieves her craftsman. You may never transport a resource over a space that is not empty. You may never deliver a resource to the building site of an opponent. A building site tile doesn't have a specific orientation within a space. It is therefore possible to deliver a resource to a building site from any side of the space it is lying on. A resource lying on a building site may never be transported again. one of the four contracts displayed face up on the main board. Place the fulfilled contract card face down next to your board. If it was a contract from the main board, immediately replace it with a card from the draw pile. Important : you are allowed to erect a building even if there are more resources on your building site than what is required by the contract you're fulfilling. However, any additional resources are placed on your storage area and each one will cost you 1 point during the final scoring. Example : Black has Stone, Wood and Wheat on one of his building sites. "He decides to erect a building with a contract from the main board which requires "Wood + Stone". He replaces his site and the resources by one of his buildings. The building site goes back on his guild board. Both the Wood and the Stone (used for the contract) return to the general reserve. The (unused) Wheat must be placed on the storage area of his guild board. He then uses the power of the card to turn his Clay into Food. After that, he places the card face down next to his guild board. A new card is drawn from the pile to fill the empty space. He game ends after a player has erected his fifth and last building. That player is given the end-of-game card and his turn is immediately over. 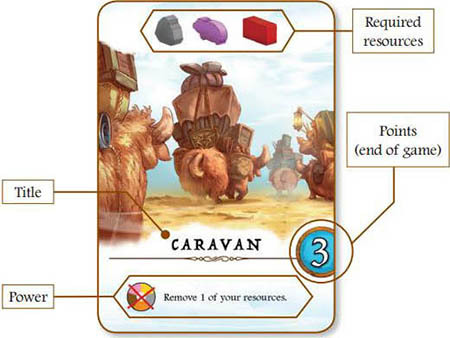 As stated on the end of game card, all other players then get one final turn, after which all the players must collect any resources left on their building sites or exploitations and place them on the storage area of their guild board. The final scoring round then takes place. The points on your fulfilled contracts. Note: Any cards you still have in hand are ignored. The 2 points from the end-of-game card (for the player who triggers the end of the game). You must now deduct 1 point for each resource present on your storage area. The player with the highest score wins. In case of a tie, the player amongst the tied ones who has the least resources in storage wins. If there is still a tie, the tied players share the win and shake hands. Each player gets 2 private contract cards. The remaining 2 cards are put back into the game box. 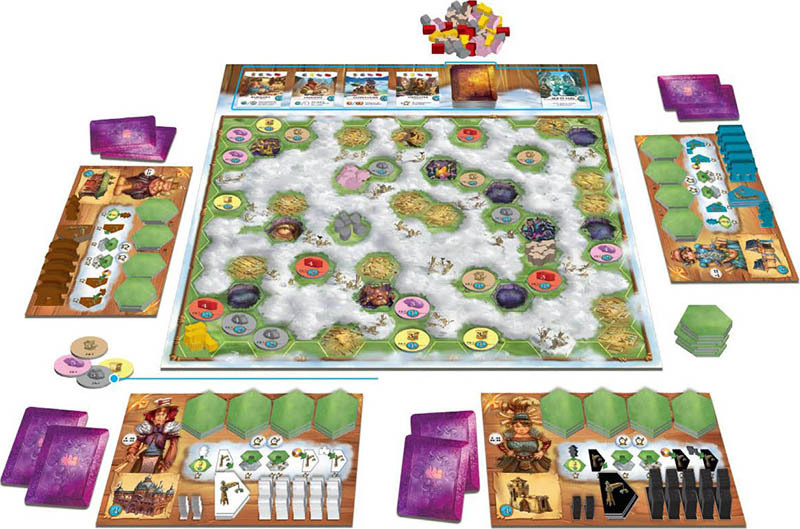 Use the back of the guild boards (marked "2 players"). Each player gets 2 private contract cards. The remaining 4 cards are put back into the game box.